Data from eurostat puts the number of unemployment in the Euro area at 16 million in 2016, close to 10% of its population aged between 18 and 74 years of age. This is equivalent to the entire population of the Netherlands or 8 times the population of Paris. Clearly, the number of Europeans struggling on a daily basis is much higher than the official figure coming from the eurostat. This is because any person that works at least one hour per week is considered to be employed. The failure to consistently reduce the number of unemployed people over the last 10 years is a clear sign that the European Union (EU) authorities, headed by the European Central Bank and the European Commission, are yet to successfully design common economic policies for a diverse range of capitalist economies. The situation got worst after the Great Financial crisis. The Gross Domestic Product (GDP) contracted twice within a short time period – see figure below. Initially, it dropped by 6% from the first quarter of 2008 to the second quarter of 2009, followed by another 2% reduction between 2013 and 2015. The GDP in the EU peaked back to pre-crisis level only in the last quarter of 2015, nearly 10 years after the unprecedented downturn. Growth expectations for the remaining months of 2016 are feeble. Germany and the United Kingdom are the only economies that moderately recovered from the Great Financial crisis. Outside the EU, most of the economies worldwide recovered from it. 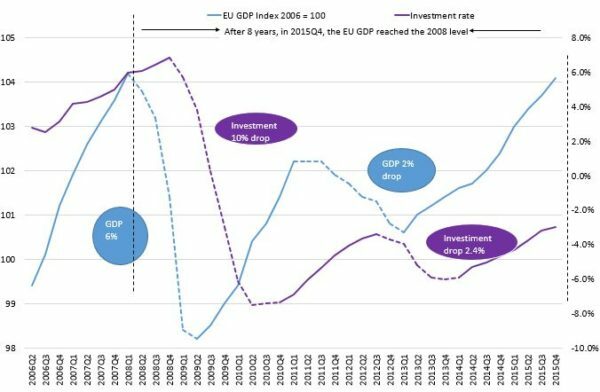 Investment rates within the EU private sector collapsed 16% never to get back to pre-crisis levels – figure above. Recently, it swung back upwards but still remains deep within the negative territory – figure above. The economic downturn from 2008 has had a permanent impact in the investment rates of all euro area economies. It shifted the economic prospects of the region to a permanently low level. European leaders are absolutely clueless about how to drag the entire region out of a sustained depression. They are kicking the can down the road. The positive rhetoric coming from the European Central Bank and the European Commission disguises the deep issues that the EU area has been facing since the creation of the single currency in 2002. The president of the European Commission, Jean Claude Juncker, will respond to the Brexit vote with further integration. He is actively pressing member-states to accept “European” solutions with another layer of integration. However, he has yet to publicly announce that European Commission drastically failed to reduce unemployment within the EU. In a democracy, a major re-think of economic policies would have taken place to quickly reduce the unemployment rate. EU politicians who share the same view as Juncker are turning a blind eye to raw economic data in pursuit of their grand abstract view of further integration. They are yet to impose a strict deadline on themselves to reduce the misery of its citizens or, otherwise, step down from their positions.